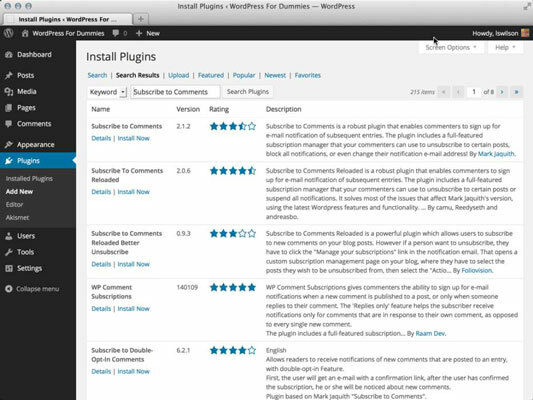 You can easily install a plugin in your WordPress blog using the built-in plugins feature. The auto-installation of plugins from within your WordPress Dashboard works only for plugins that are included in the official WordPress Plugin Directory. You can also manually install plugins on your WordPress blog. Click the Add New link in the Plugins menu. The Install Plugins page opens, and you can browse the official WordPress Plugins Directory from your WordPress Dashboard. Enter a keyword for a plugin you’d like to search for. For example, if you want to search for plugins that allow you to add additional features for comments on your site, enter the word Comments in the Search Plugins text box to return a list of plugins that deal specifically with comments. You can also search by tag by clicking any of the tag names that appear at the bottom of the Install Plugins page under the Popular heading. You may want to install a very popular plugin called Subscribe to Comments, by Mark Jaquith. To find it, enter the words Subscribe to Comments in the Search text box on the Install Plugins page. Then click Search Plugins. Click the Details link below the plugin name. A Description window opens, giving you information about the Subscribe to Comments plugin, including a description of the plugin, version number, author name, and an Install Now button. You go to the Installing Plugins page within your WordPress Dashboard, where you find a confirmation message that the plugin has been downloaded, unpacked, and successfully installed. Specify whether to activate the plugin or proceed to the Plugins page. Return to Plugin Installer: Click this link to go to the Install Plugins page without activating the plugin. The auto-installation of plugins from your WordPress Dashboard works on most web-hosting configurations. However, some web-hosting services don’t allow the kind of access that WordPress needs to complete the auto-installation. If you get any errors or find that you are unable to use the plugin auto-installation feature, get in touch with your web-hosting provider to find out whether it can assist you.